We label most everything. Assigning a verbal tag is an essential part of modern life. Turn on cable news, and you’re likely to read: “Breaking News, Terror Alert.” It’s probably not actual breaking at that very moment, but such is the effectiveness of labels. To label something is to make it “at hand,” a part of the world that lies under our control, our comprehension. Labels are verbal short-cuts for thought. Once something has been labeled, it’s been reined in by the one who labels. Unfortunately, it has also been reduced in its own right. Politics has always been about labeling. Consider what’s been accomplished this year alone by labeling another a loser, a choker or a liar. We call him Doubting Thomas, a very unfair label, especially for someone, so much like ourselves. Thomas simply believes that he understands the way of the world. He grasps, as we like to say, the laws of nature. He knows what can be expected. Maybe we should label him, “Contemporary Thomas.” After all, he doesn’t doubt something reasonable, something scientific, as we like to say. He only doubts the incredible. But as the Duke Divinity School theologian Norman Wirzba points out in his insightful little book From Nature to Creation (2015), the notion of nature as a passive object, which lies ready to hand for our use, even our exploitation, is a relatively modern. The ancients thought the world to be infused with spirits. These spirits were the explanation for the phenomena, at which our forebears marveled. Spirits, good or bad, caused storms, earthquakes, childbirth and death. Admittedly, that strikes us as foolish, but at least admit that the ancients stood in awe of the world around them. They found it worthy of their reverence, their respect. The earth wasn’t simply theirs for the taking. Now we have reason to fear what we have wrought, approaching the world as “nature,” as nothing more than the object of our desires, our comprehension. In reducing the earth, our very human world, to nature we have threatened it and ourselves. Now we hope that making earth a mother, garlanding a tree, will solve our problems. Those who exploit always label. It’s part of the process, realized or not. Given the modern conception of motherhood, as something undertaken only by personal preference and otherwise tightly controlled through contraception, do we truly reverence the earth and her bounty by labeling her “Mother Nature?” Hasn’t “motherhood” long since become one more reality that we control? Blessed are those who have not seen and have believed” (Jn 20: 27-29). 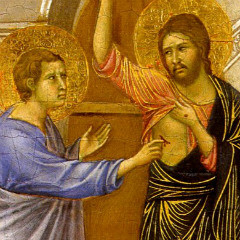 In asking Thomas to touch his wounded flesh, Christ reveals creation itself to the saint. He reveals a restored and renewed world, one which has come forth from God, a world, which corresponds to our reason because it was created by the highest intelligence. Christ reveals a world which, because it comes forth from spirit, remains, even in its most physical manifestations, oriented toward spirit. Christ makes known a world which came from love and which will yet be redeemed by love. Thomas wasn’t a doubter. He was simply one of the shallow ones, who think that reality is reducible to what they understand. The resurrection of Christ reveals a world still full of wonder and possibility, because the earth comes forth from spirit and returns to spirit. If the doors of perception were cleansed, everything would appear to man as it is: infinite. For man has closed himself up, till he sees all things thro’ narrow chinks of his cavern. We’re the ones who chose to make the world into a cavern of our small consciousness, but we can also decide to open our eyes and hearts and to say with Thomas, “My Lord and my God” (Jn 20:28). The Fourth Gospel is full of signs. Events, gestures and objects, which must be pondered if they are to reveal their inner meaning. It is the same in the liturgy, where the resurrection is both proclaimed and realized. It’s here that earthen things like water and oil and smoke are given new, transcendent meaning, spirit infused significance. In the Eucharist, bread and wine break through past and future to become the Body and the Blood of the Risen Lord. and what is happening, and what will happen afterwards” (Rev 1: 17-18). The shallow think that the purpose of liturgy is education, encouragement. They make of it one more human tool, reducing it to an ecclesial pep rally, always looking for something novel to exploit. But it is in the liturgy that the material world is honored as creation rather than exploited as nature. In the liturgy, in its quiet motions and graceful gestures, that we slip from the caverns of our consciousness. We foolishly think that Thomas was overwhelmed by proof, but nothing that is worthy of, that calls to, the human spirit is made evident to us by proof: not love, not beauty, not a truth large enough in which to live. There are essentially two choices, two ways of living in the world. Labeling everything in our purview to make it ours, or sensing within, and beneath, the material world, a spirit, a presence, that is not ourselves, from which we come, by which we are redeemed, even from our ways of thought. This view of the Doubting Thomas story misses the obvious, common sense understanding. The New Testament does not ask us to believe in the Resurrection on the basis of a blind leap of faith; nor is the New Testament merely a work of art that inspires awe (like Star Wars). Clearly, in the ordinary sense of what the words plainly say, the Gospel writer intends this as EVIDENCE that Jesus really rose from the dead. If I had been there with my i-phone, I could have taken a video of the events described in the Gospel and posted it online. The Resurrection is a HISTORICAL event. Over the last few decades all kinds of new evidence has emerged de-bunking so-called "higher criticism" (Bultmann, Ehrman, etc.). If anybody is interested, I can offer numerous scholarly citations. Or, just do a google search on "proofs for the resurrection". This has, for 2,000 years, been the central teaching of the Catholic Church: Reason and evidence support the Faith; The Holy Spirit guides us the rest of the way home. Christos Anesti! Alithos Anesti! Certainly the Church is not a religion of the book in the narrow Protestant fundamentalist sense. The Bible did indeed arise out of the Church and Tradition. I did follow your suggestion and read Dei Verbum and it does assert the authority of the Bible. When I read the Catechism, I am struck by how much Catholic Teaching is supported by the Bible. After all, passages from the Bible have been read at every mass for 2,000 years. With regard to "infused knowledge" you are of course correct, but again going back to the Bible, in the Gospel of John, the Lord Jesus tells his disciples he will send a Comforter, the Holy Spirit, who will open up new areas of knowledge and guidance for the church. My central concern in these days is that particularly in North America and Europe many people do not even know what Christianity is, including many that consider themselves to be Catholic or Christian. In my judgement, we need to continually emphasize the historicity and object fact of the Resurrection because, as St. Paul, said without the real, literal (still involving a spiritual body) resurrection there is no hope for the home for the human race. Over the last several decades more evidence supporting the Resurrection has emerged. See: Wolfhart Pannenberg, N.T.Wright, Gary Habermas, William Lane Craig. My email is alanborgh@yahoo.com. God Bless! Christ is Risen! Note: I do not want to see the same cancer of modern biblical criticism destroy the Catholic church as the mainline proterstant denominations have been destroyed. Again, the Bible and Holy Tradition are NOT simply great works of art or forms of entertainment.... WE NEED MORE APOLOGETICS! "Those who exploit always label." The example chosen for exploitation is motherhood. Of all of the possible examples of exploitation available, why would anyone choose motherhood? This example is not even true! This kind of misogyny is unacceptable.